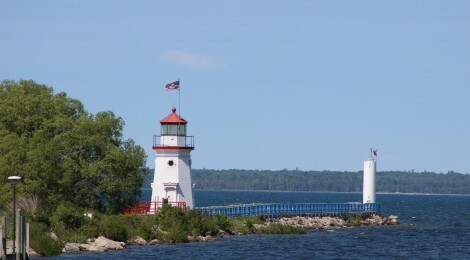 The Cheboygan Crib Light has been a symbol and source of pride for the city where it lies for decades, appearing on the logo for the Chamber of Commerce, tap handles at Cheboygan Brewing Co., and more. 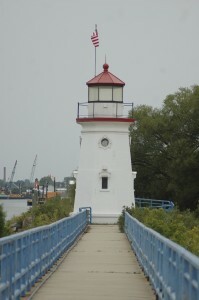 The light is located in Gordon Turner Park, where there is also a playground, beach, and boardwalk. 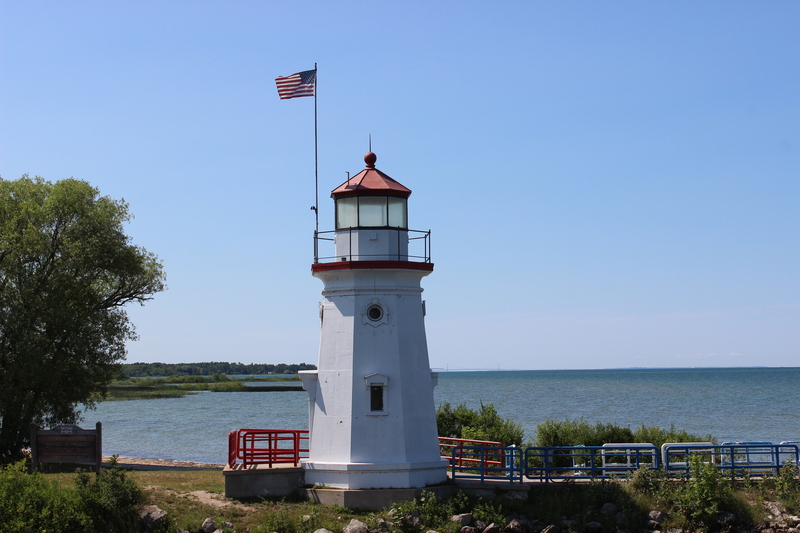 The park is also located at the point where the Cheboygan River meets Lake Huron and distant views of the 14 Foot Shoal Light and the Poe Reef Light can be taken in from the end of the pier. 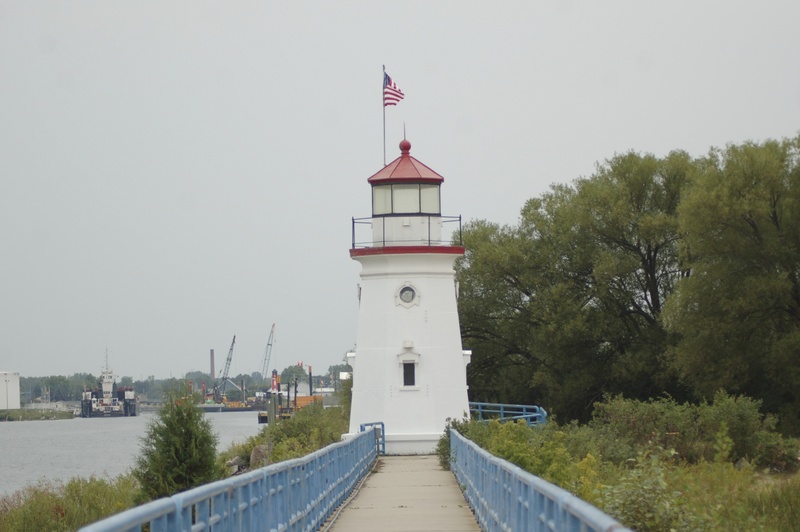 Cheboygan is a city with a population near 5,000 today but it was at one time an important lumber port. 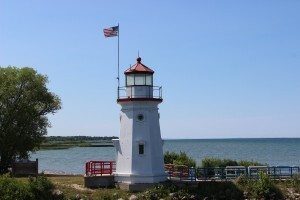 This light was erected and placed atop a concrete crib in the lake in the 1880s, and it had a difficult existence there until it was automated in the 1920s. By the 1980s it was made obsolete by advancements in radar and other technology, and it was moved to the park where it can be found today. 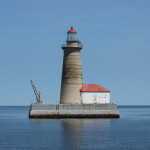 It may no longer function, but it has a simple charm and is a reminder of maritime history. The tower is 25 feet tall and octagonal, painted white with red trim and a red roof. The crib light also features small circular and rectangular windows on its lower section. In addition to the two lighthouses that can be seen offshore, there are two other lighthouses in the immediate area: the Cheboygan River Range Light is a few blocks away and the ruins of the Cheboygan Lighthouse can be hiked to at Cheboygan State Park. 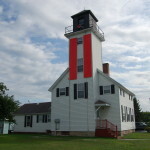 Forty Mile Point Lighthouse is within an hour’s drive to the south, and the Old Mackinac Point Lighthouse is 20 minutes away to the northwest. 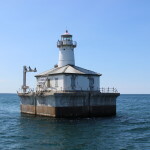 The Cheboygan Crib Light can also be viewed from the Eastbound Lighthouse Cruises offered by Shepler’s Ferry of Mackinaw City. Cheboygan is the home port of the U.S. Coast Guard cutter Mackinaw, as well as the Kristen D. of Plaunt Transportation. 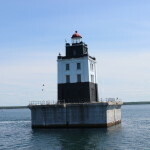 The latter is a passenger ferry that travels to Bois Blanc Island, which is home to the Bois Blanc Island Lighthouse that we featured recently.